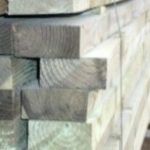 All the tanalised timber products featured on this page are available from stock with delivery in 2-5 working days. 75mm(3in) x 22mm(1in) Tanalised Brown rail. Available in 1.8m(6ft), 2.81m(9ft) and 3.6m(12ft) lengths. Pressure treated 75mm(3in) x 50mm(2in) tanalised timber rail. Available in a 3.6m(12ft) length. Available in 0.9m(3ft), 1.2m(4ft) and 1.8m(6ft). 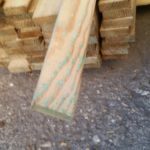 Tanalised timber is wood that has been treated with a chemical preservative compound. 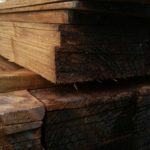 Pressure treated tanalised timber is vacuum pressure treated to ensure the preservative reaches the core of the timber. The treatment consists of anti-fungal, insecticide compounds and a preservative that promote durability and long life. 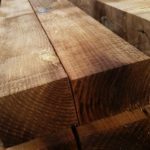 The timber we supply is sawn timber treated with tanalith “e” compound. This is an environmentally friendly water-copper based solution which is safe to touch and won’t harm pets. This should not be confused with CCA treatment that uses arsenic and chrome compounds that has been withdrawn from use. Because this timber has been preserved with anti-fungal treatment and insecticides it is ideal for outdoor use. 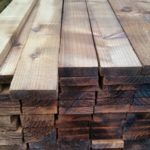 This type of timber is ideal for wooden fencing, gates, raised beds and all manner of uses ensuring a long life without the need for regular brush on treatment. Unlike untreated timber, tanalised timber should last outdoors free of rot and insect attack for a good 15-25 years. 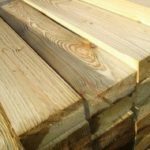 We supply a whole range of standard timber fence and gate posts in all the common sizes. 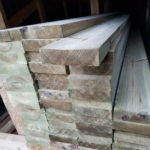 We also carry all the boards, rails, cappings and pegs necessary for all timber fences. If you look further around our site you will also be able to find a range of gates, timber garden furniture and decking that has been tanalised for durability.